The winter school Eye Tracking – Experimental Design, Implementation, and Analysis, organized by ETH Zurich, aimed at helping researchers extend their knowledge and skills in eye tracking methodology, and furthermore to enable networking among participants and to encourage future cooperation. The winter school had a session dedicated for presentation of research ideas and projects on 20/01/16. 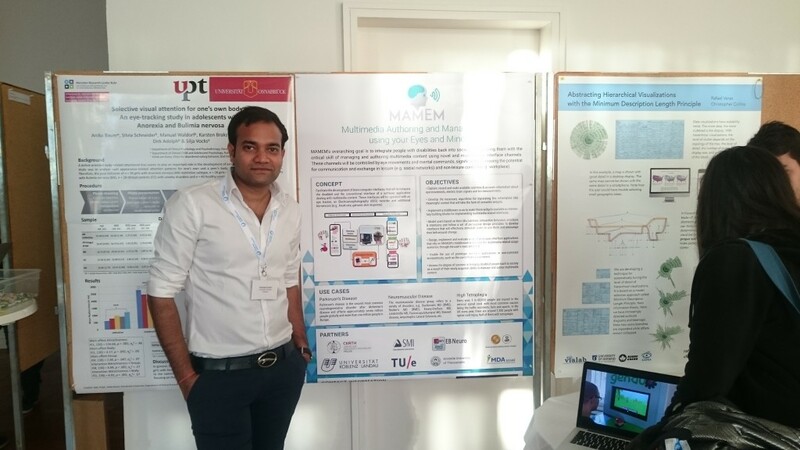 Chandan Kumar from University of Koblenz, introduced the MAMEM project using a poster presentation. The poster was displayed among other students/researchers’ posters in a large room. The MAMEM project details with the early demo prototype were presented to the interested audience. In general, there were positive reactions towards the MAMEM objectives and initial prototype. Furthermore there were several relevant discussions with eye tracking – HCI experts, researchers, and students, which should be very helpful for future work.